If it's a new hard drive or one that you have just plugged into that specific machine, you might want to check if the cabling is correct and, in case it's an external one, if it has a power switch hidden somewhere on the back. 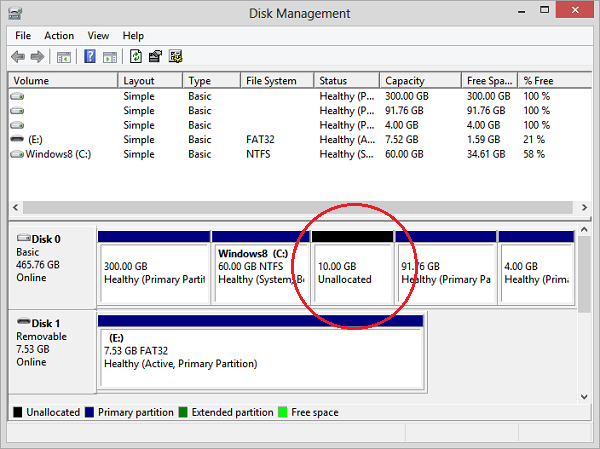 A new disk has none of those fancy partition blocks with colored stripes yet but plenty of unallocated space, like the one circled in red. This space needs to be formatted into an NTFS partition. Basically you can just right-click it, choose to create a new simple volume and click your way through the setup, you'll create one big partition by doing that. Afterwards the new drive should show up on Computer. Nearly the same goes for drives or partitions with Linux operating systems or similar which Windows cannot read. 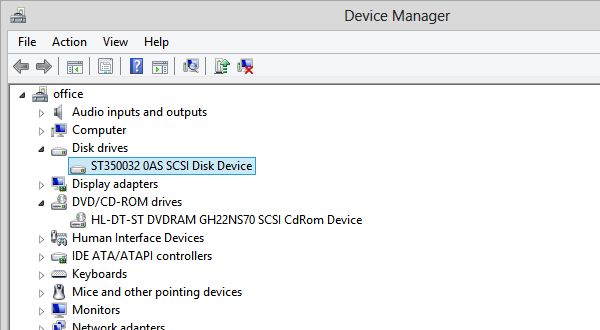 These will be displayed in the device and disk management but not on Computer, so if you don't need the old operating system any longer and want to use the drive on Windows, you'll need to format it to NTFS first. Another common source of confusion is a missing drive letter or path on a drive. The drive letter is the letter in front of your drive or partition, for example C:\ on your main drive. Every drive needs one so you can access it and if it's missing for some reason, the drive will not be shown. The solution to that problem is in Disk Management again, so head there as described above and right-click the drive that's not displayed (you'll most likely notice it by the size). If the drive is already formatted, right-click it and select Change Drive Letter and Paths.... Add a drive letter of your choice that's not already taken and the drive should show up again. It can happen that a drive of yours is disabled or offline. You can check in the Device Manager if that is the case. Go there as described above and right-click the drive you want to check. If you have the option to enable it or put it online then try that. If these options fail it might be that the drive is corrupt. Windows hides empty drives by default. This usually should not be an issue if your drive is formatted but you can change the setting anyway if you want to. Go to Control Panel > Appearance and Personalization > Folder Options. In the View tab, uncheck the Hide empty drives in the Computer folder box. I’ve been fighting this problem for hours, and all other ‘fixes’ missed the mark. The solution was so simple…. Not shown in Disk Management. Not shown in Win Explorer. Unplug and replug them in and nothing. One is a 2Tb ext HDD (USB) and the other a 500Gb internal HDD.